WANTED . . . Coleraine winger, Darren McCauley is subject of a two-team race between Derry City and Inverness. INVERNESS Caledonian Thistle manager, John Robertson is hopeful of finalising a deal to bring Derry City target, Darren McCauley to the Scottish Championship club this month. The Highlands club are understood to be in pole position for the Coleraine winger's signature as they prepared to make an improved offer for the Top of the Hill native earlier this week. 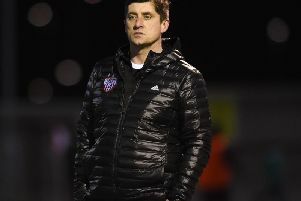 And while Derry City remain interested in bringing the player back to the Brandywell before they set off on a four day pre-season training camp to the Isle of Man next Monday, the club has yet to make an official bid. McCauley has agreed personal terms with the Candy Stripes but is also understood to be on the verge of accepting an offer from Caley Thistle should they allow him to finish his final year of a Nutrition degree at Ulster University. Ex-Derry City boss, Robertson is keen on adding McCauley to his squad before the end of the January Transfer window but confirmed a deal with Coleraine has yet to be completed.